Let’s make some crostini. 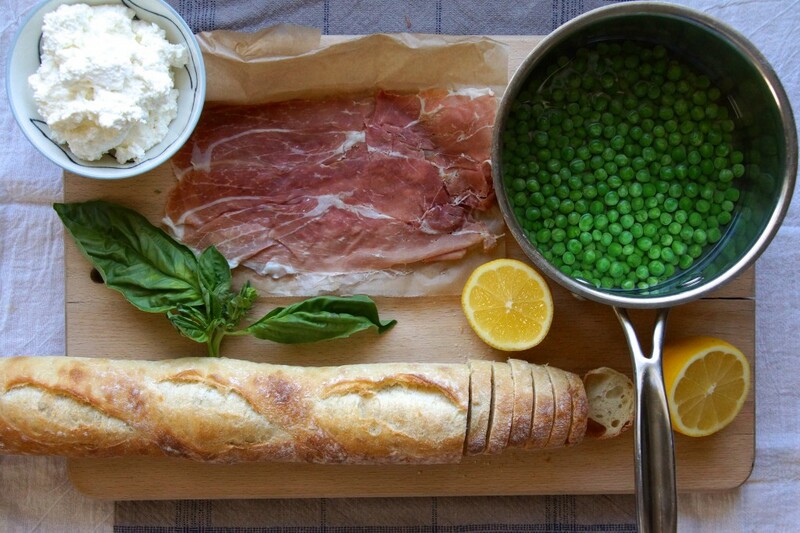 Grab your ingredients: fresh, creamy ricotta cheese, thinly sliced prosciutto, plenty of peas, basil, lemon, and a baguette. First things first, turn your bread into crostini. Slice, drizzle, and pop them in the oven ’til they’re golden. Smash the peas with the back of a fork. Stir in ricotta, add a squeeze of lemon, toss in a handful of chopped basil, sprinkle with salt, and finish with a few grindings of black pepper. 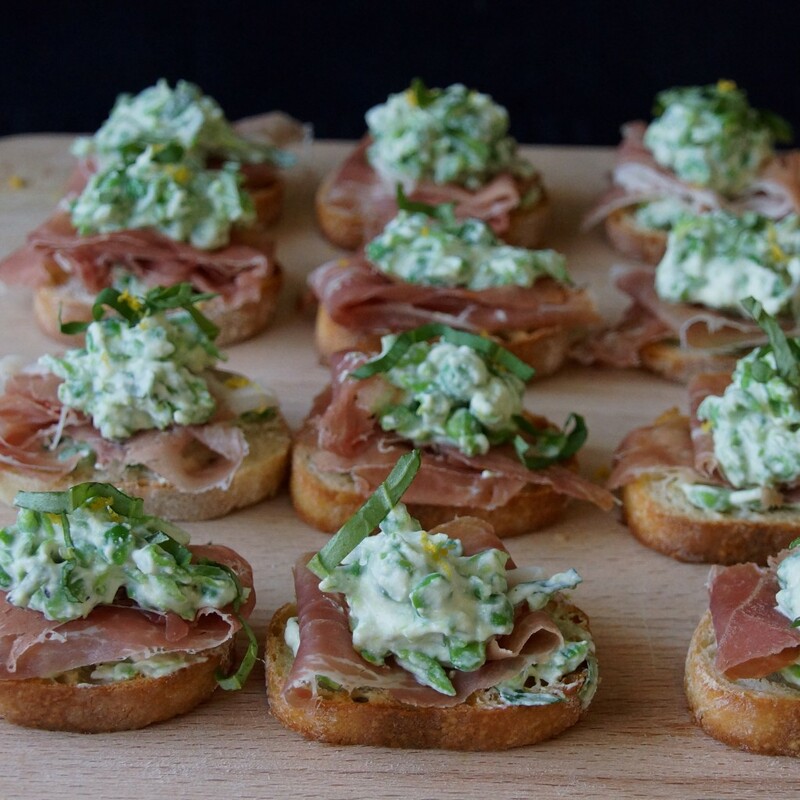 Smear a little of the ricotta-pea mash on the crostini to anchor the prosciutto. Fold the prosciutto over the top and dollop with more ricotta. Garnish with lemon zest and a few threads of basil. Success: I’ve got one more recipe for the index and one more appetizer in my couch-dinner repertoire. You could use cold-smoked salmon in place of the prosciutto for an equally delicious appetizer. Preheat oven to 400°. 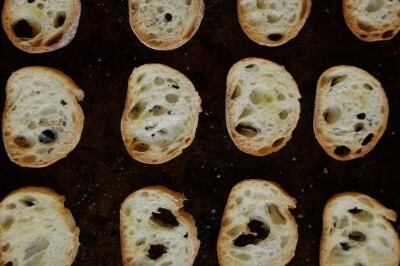 Place the baguette slices on a baking sheet and lightly drizzle or brush with olive oil. Bake until lightly golden and crunchy, about 8 minutes. Meanwhile, cook the peas in simmering, salted water until tender, about 2 minutes. Drain and transfer to a medium bowl. Smash the peas, using the back of a fork or a potato masher. Personally, I like the rustic, chunky look, but if you'd prefer a more evenly green topping for your crostini, puree the peas in a food processor until smooth. Fold in the ricotta and season with salt, freshly ground black pepper, 2 Tbsp. basil, and about 2 tsp. of lemon juice. Assemble the crostini. Spread a very small amount of the ricotta-pea mash on the each crostini. This will serve as the "glue" to hold the prosciutto in place. 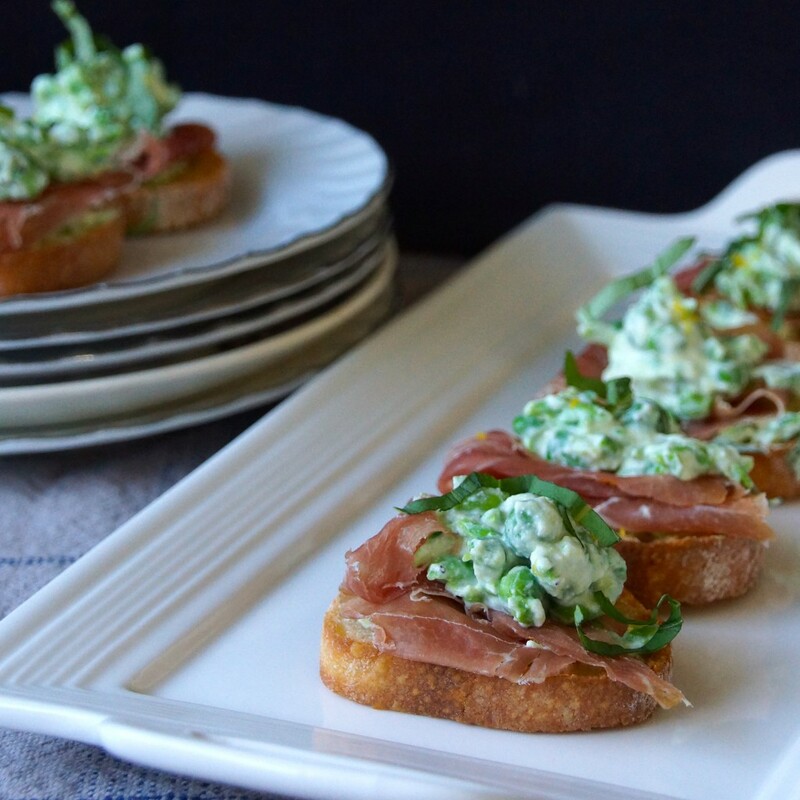 Take about a ¼ of a slice of prosciutto and drape it over the top of the crostini. Spoon a heaping tsp. 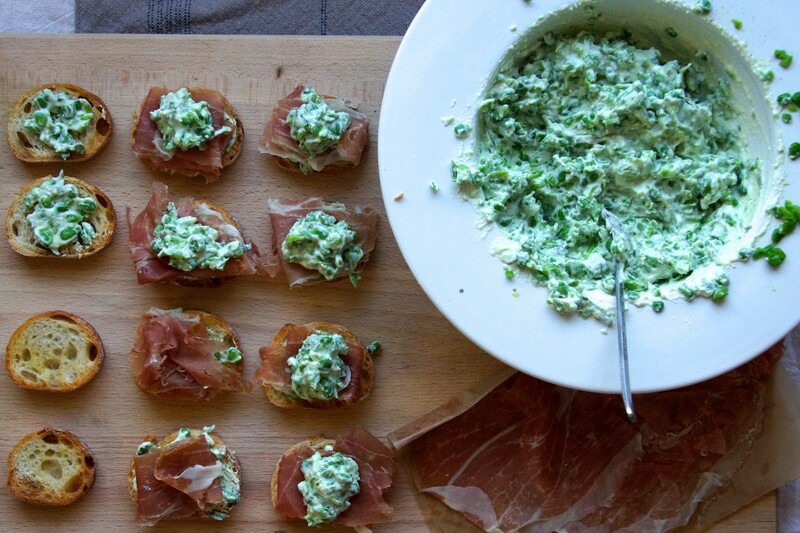 of the ricotta-pea mash on top of the prosciutto. Sprinkle with additional basil and lemon zest. The ricotta-pea mash could be made a day or 2 ahead of time. These look wonderful…. I’m wondering why you didn’t bring them along for Easter????? They sure would have put my TJ’s appetizer tray to shame!!! You and Matt must have eaten them all since they were so good!